Fashiontweed: My favourites...i want them all! I want them...i want them...i want them...especially the Miu Miu shoes!!!!! these are awesome..I love them too!! Amazing, all of them: love the black & white combo, love the shapes. Thanx 4 sharing, Sonja. All the best. What an amazing selection. Most of them are on my wish list too! 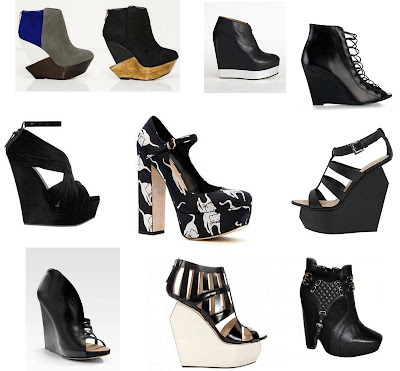 I want the Jeffrey Cambell Tick Wedge bootie too!!! Gosh I want them all! i want the miu miu pumps and the second ones! Amazing shoes!! Each & every one of them! YUMMYYY!!! You have greta taste! !